Factors to consider before buying a complete wreck! I always prefer a tear down (tearing the structure down to its foundation) verses a fixer upper. For me, I like to start from scratch so I don’t have limitations during construction. 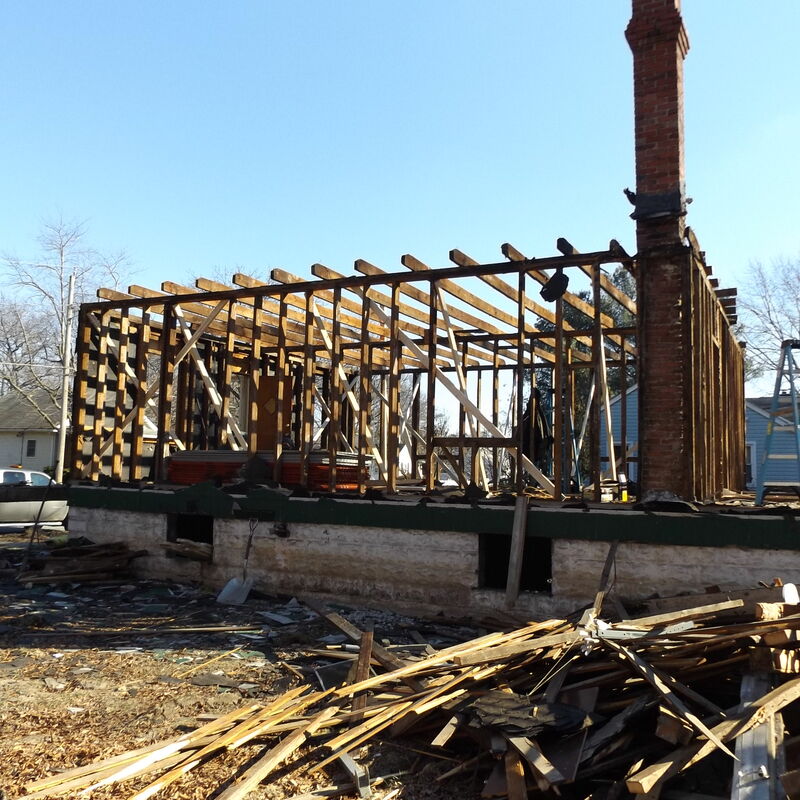 In Baltimore County, Maryland, if you rebuild on the existing foundation footprint, you are building under a renovation permit and are avoiding the cost of a sprinkler system which is now a requirement for new construction. When considering to invest in a complete tear-down, it is important to closely consider all possible complications and costs to assure that your sale price with a profit still works in the neighborhood. Neighborhood: You can’t change the neighborhood! Are people actively buying homes in this neighborhood? Although there are never guarantees that a house will sell fast and for the price you’re asking, there are reports available to show the neighborhood real estate activity (see report). The Lot: Is the lot level or is there at least enough room in the back of the house for playing and entertaining? Even the toughest terrains will sell, but problematic terrains can take much longer to sell. I’m looking for lots that appeal to the majority of buyers. Basement: Is the basement tall enough to finish? I almost never do, but the buyers almost always want the option to finish the basement. Is the foundation in need of great repair? Is there water penetration? If you’re questioning the foundation, have an engineer take a look. It costs me about $300 for a basement structural inspection. Remember, most buyers will get a home inspection. Basement issues top the list of buyer’s concerns. Water/Sewer: I prefer houses that have public water and sewer. If you’re considering a rehab on a well and septic, you may want to have each inspected before you buy. My experience in Baltimore County is that the newly required septic system can cost $30,000 – $50,000! Furthermore, if the well doesn’t meet the required yield per minute, you’re drilling holes through-out the property while praying you find enough water sooner than later, and paying lots of money along the way! No water = worthless investment. Electric: How much existing power is there? Most houses today offer at least 200-amp service. This allows adequate power and flexibility to determine equipment and appliance selections with room to expand. Older houses typically have 100 to 150-amp service. If this is the case, you’ll be required to power-up. For me, this involves my electrician meeting with a designer from the power provider (Baltimore Gas and Electric) to determine what is involved in bringing a new supply line to the house. Sometimes this can be an unexpected expense for you. Natural Gas: Is there natural gas in the house or is it available? If not, consider the cost to install propane tanks somewhere on the property. I have found that many buyers prefer gas service for cooking and in most cases for heat. Environmental: Consider all of the potential environmental hazards you could be faced with abating. Are there underground tanks to remove, or are there asbestos shingles, asbestos siding or asbestos flooring to remove? How about lead paint? The EPA requires demolition of houses containing lead paint to be performed by properly licensed individuals and firms. Removing environmentally hazardous materials can be costly. Neighbors: Look over the fence! Would you want to live next door to the neighbors? Do they take care of their property or do they hoard trash? Are there barking dogs or broken down cars in the yard and driveway? Know before you dump in the cash! Other important factors to consider are the schools, area shopping, traffic patterns, county assessments and crime. Have you considered all the factors and it still looks good? Let the demo begin! If you’re interested in having the Sachs Group assist you with your next rehab investment or rental investment, please don’t hesitate to call us. You can also visit our website The Sachs Group for more valuable information.